The paved New Berlin Recreation Trail runs straight as an east–west compass bearing for 7 miles through the western Milwaukee suburbs, from New Berlin to Waukesha. 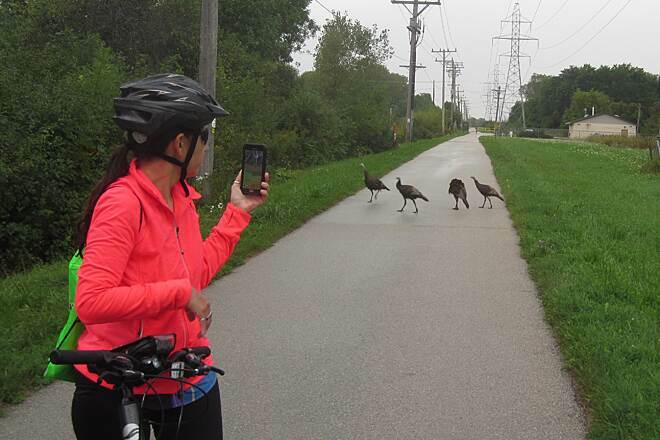 While it is void of trestles, tunnels, and trees as it passes beneath the power lines of We Energies, many residents find it a fast and convenient commuter route, with a few distractions along the way. 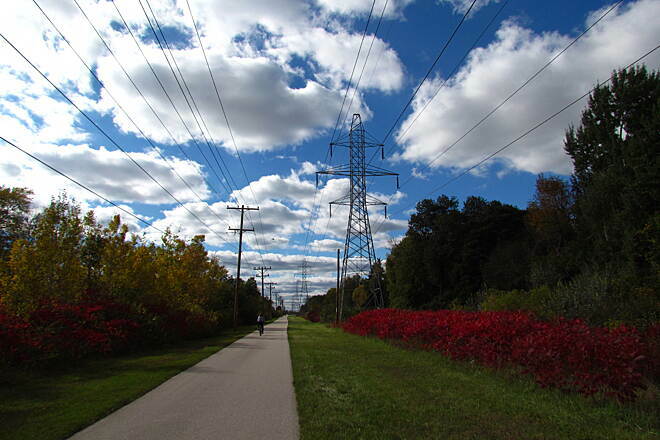 This rail-with-trail follows the former interurban railway route of the Milwaukee Electric Railway & Light Company, which started running trains and providing electricity in the 1890s. Waukesha, New Berlin, and West Allis were sleepy outposts at the time, but a critical turning point came in 1892 when Wisconsin chose West Allis as the official location of the annual state fair. The electric railway launched trolley service toward the west in 1898, and the communities began to thrive. Railway business declined, however, as car and truck use expanded in the 20th century. The Waukesha line, taken over by the Milwaukee Rapid Transit and Speedrail Co., was shut down in 1951, leaving only the utility corridor. 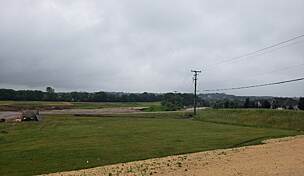 The New Berlin Recreation Trail begins in the east at the Waukesha–Milwaukee county line on South 124th Street. 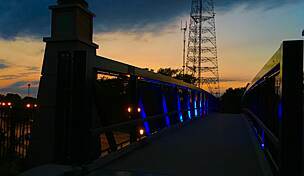 Here, it connects in Greenfield Park with the Oak Leaf Trail and West Allis Cross Town Connector Trail. Two miles north is the Hank Aaron State Trail, which runs nearly all the way into downtown Milwaukee. 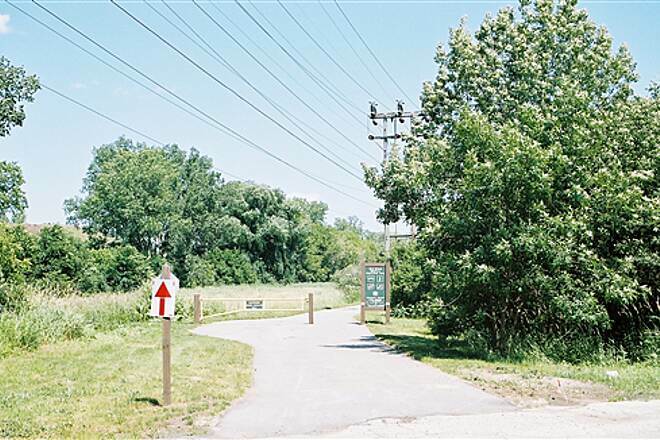 In the west, the trail ends within 2 miles of both the Fox River State Trail and the Glacial Drumlin State Trail, which travels cross-country to within 6 miles of Madison’s bike path network. 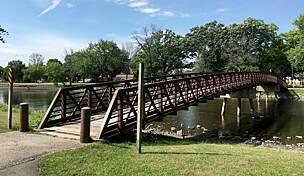 Beginning at the 282-acre Greenfield Park, you’ll head west on a pedestrian bridge over South 124th Street and enter Waukesha County and the city of New Berlin. 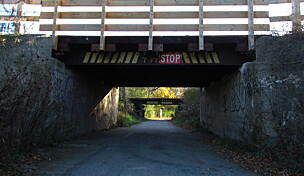 Railroad tracks run alongside the trail on the wide right-of-way, and trees screen leafy, established neighborhoods. After 1.2 miles, you’ll pass the entrance to the shady Gatewood Park, and at 2.4 miles you’ll find Buena Park, which has restrooms. A bike shop sits at the corner of Calhoun Road at mile 3, with a couple of cafés nearby. The electric railway stopped at the Calhoun crossroads in the old days, and the Pabst Farms grew hops in a nearby field. The trail takes on a more rural character as you begin a 3-mile stretch without any street crossings until Springdale Road. Two miles later, you’re waiting at the unsignaled crossing of six-lane Les Paul Parkway, named for the famous guitar player and designer. 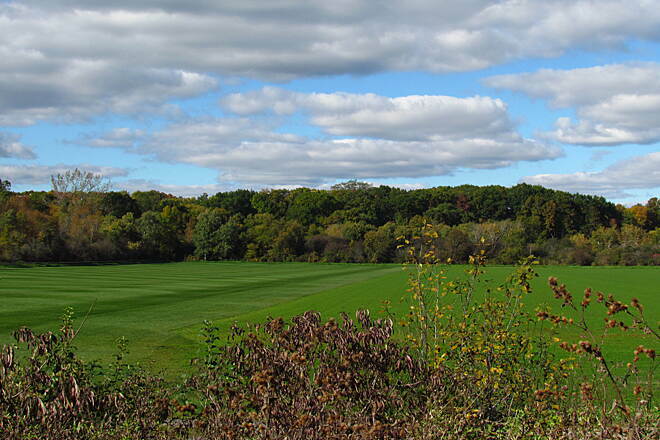 Waukesha has its share of restaurants, brewpubs, and a Saturday farmers market that make it a close-by getaway from Milwaukee via the trail. To reach parking for the eastern endpoint from I-94, take Exit 301A south toward S. Moorland Road. Go 0.4 mile, and turn left onto SR 59/W. Greenfield Ave., heading east. After 2 miles, turn right onto S. 124th St. Go 0.6 mile, and turn left into Greenfield Park on Park Dr. To reach the New Berlin Recreation Trail, take a small trail north from the parking lot to the West Allis Cross Town Connector, and turn left. 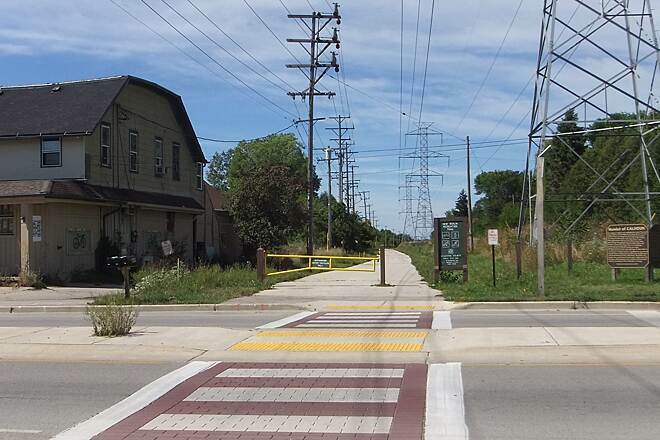 The New Berlin Recreation Trail is 0.2 mile ahead. To reach parking near the western endpoint in Waukesha from I-94, take Exit 294, and head south onto County Road J/Pewaukee Road. Go 2.4 miles—Pewaukee Road becomes E. North St.—and turn left onto NW Barstow St. Go 0.3 mile, crossing the Fox River, and turn left onto W. Main St.; then, in 0.1 mile, turn right onto N. East Ave. Go 1 block, and turn left onto Arcadian Ave. Go 2 miles—Arcadian Ave. joins WI 59—and turn right onto Springdale Road. In 0.3 mile, look for parking on the left. The trail ends 1 mile west of here. Except for the fact you will be riding under the power lines all the way this is a nice trail. 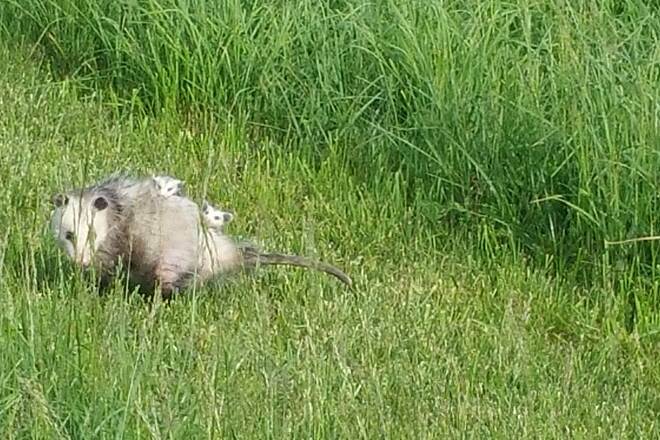 If there is a little breeze you can't here nearby traffic. It passes through back yards, a few wetlands and a sod farm. 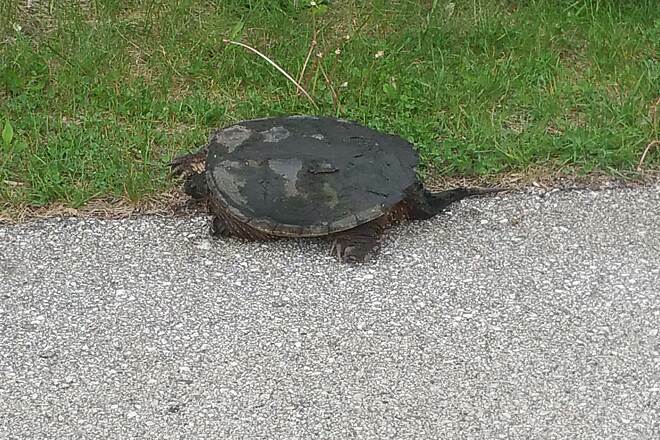 And yes, as other people have mentioned, be careful crossing the roads. It doesn't matter who's right or who's wrong. It's who's left that matters. Be careful. 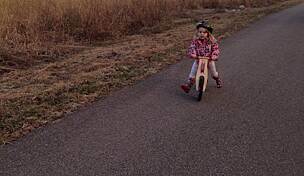 We ride this trail a lot. 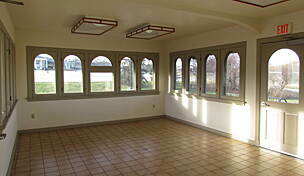 Can be quite busy but is paved. Basically slight uphill all the way to Waukesha. Trailside Cycle on Calhoun road has free air, a nice picnic table to rest at, and drinks inside. Sunnyslope, Moreland road, and Calhoun road can be difficult to cross. Cars do not slow down. Be very careful. We rode this trail continuing from the Hank Arron Trail. We rode the trail from West Allis Wi. to Waukesha Wi.. The trail is flat and headed west. Nominal head wind on the day we rode it but there are areas that have open fields that could make a westbound ride a bit more energy consuming. The trail follows tall power lines most of the way. The trail is a great connector trail and is well used my local commuters. All in all not a great scenic trail but a great connecting trail to the much more scenic Glacial Drumlin Trail. We tried out the trail on a Sunday. Nice for walking, lots of bikers. Its best to park your car by SunnySlope Rd or by Gatewood Park on Kostner Lane. 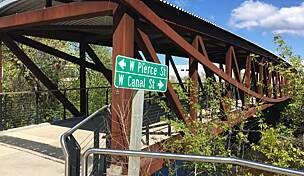 The New Berlin Trail is an easy way to go 7 miles in a very short time! Although the scenery might not be the best, but by the time I start to notice the scenery I'm already almost done with the trail. Truly an amazing trail! Like the easy grade. Went east to west and coasted back. Great path for families. There is nice views especially in the morn. Might get hot in afternoon. Agree with the greenfield park start area. Just so-so. While it is straight and level, the scenery didn't really change and there was no tree cover for hot sunny days. Bring enough water 'cause the sun can really beat down on you here. I do enjoy the trail especially now that there are either tables or benches every mile. The place that I like to park at is in Greenfield park because you can park near the trail and have a table to sit at either before or after the ride. To me the trail is very scenic considering the fact that it is in a very densely populated area. 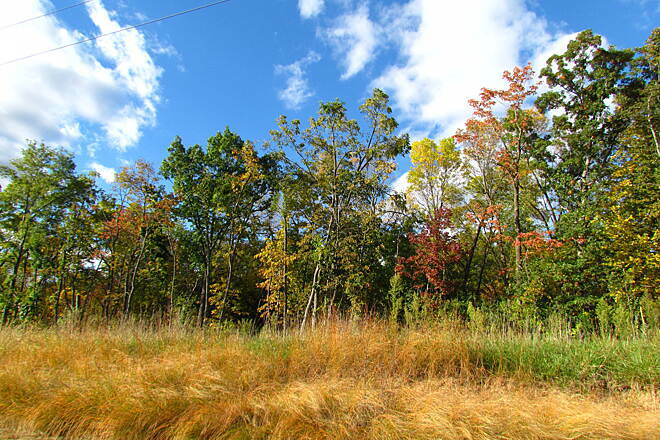 There are a lot of trees and bushes and in the fall the fall colors are very nice. The best thing I can say about this trail is the newer paved surface is great. The trail itself is as straight as an arrow with a slight continual grade upwards from east to west. High tension wires provide the scenery, although it is tree lined and some rural areas on western portion. Great trail if you just want to get out and ride. 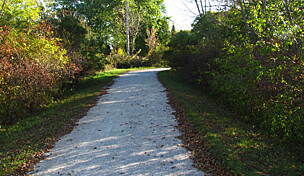 Connects with other trails namely the Oak Leaf north or south. Parking at Greenfield Park Golf Course is very convenient (bathrooms/concessions at clubhouse). There's also a bike shop at the Calhoun Road crossing if any maintenance is required. 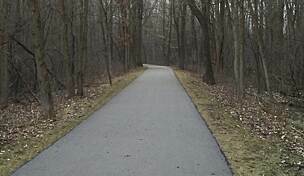 I live in Waukesha, and used this trail many times to go to West Allis and Milwaukee. Used it 3 times last summer to attend Brewers games -- it gets you about 3/4 of the way there (no fee to park if you are on bike!) The trail was improved a couple of years ago, and I believe it is now completely paved. Very safe--only need to look out at busy HWY 164, and Moreland Roads, plus Calhoun which is not as busy as the other two. 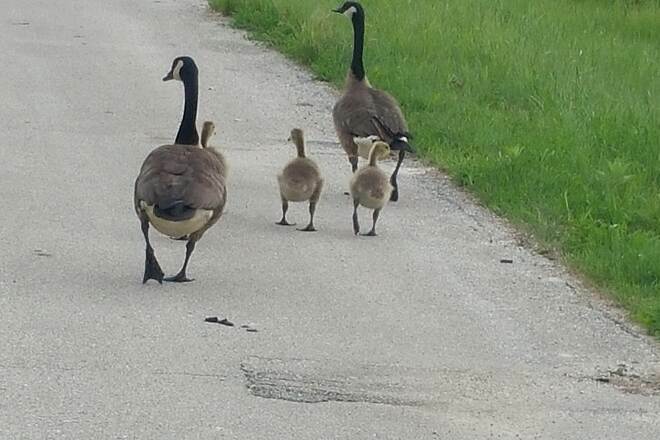 Nothing tricky about crossing, just be careful. Very flat and pretty dull, but useful for transit. I find riding the streets of Waukesha more enjoyable--it has extra-wide streets with little traffic, plus some hills and a variety of buildings and houses to look at. 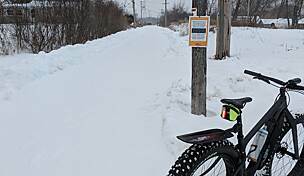 New Berlin trail is free, as opposed to Glacial Drumlin, which is part of a pay system. At the east end of the trail is Greenfield park, with a concessions stand when the pool is operating. Lots of civilization just a few blocks away. 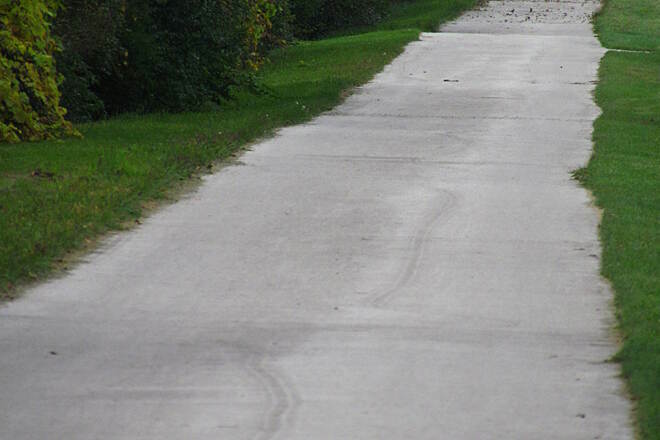 "As of June, this trail has been recently paved, making it a smooth path for roller blading, roller skiing, etc. Since then, it has seen a large increase in usage, at least from my sightings while commuting. This past summer I did this trail with some friends and really enjoyed the ride. Much more scenic than I had expected. 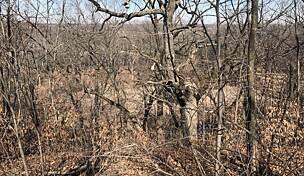 "I rode the westernmost 4 miles of this trail in September 2005. If you are gravely fearful of riding in traffic, this trail may appeal to you. Otherwise, the coarse gravel surface, location under high-tension powerlines, and industrial setting should dissuade you from making this a destination. Its value is as a connection between Milwaukee and the Glacial Drumlin." "We used this trail as a connector on our cross-state tour, but it has its merits. Yes, it's flat and follows a railroad line and high-tension power lines, but it does pass through some interesting marshes, and I like trains. 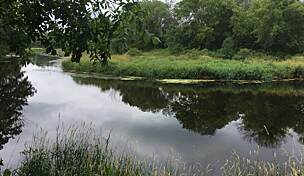 Otherwise, it is unremarkable, but will be an important link between the Glacial Drumlin and the Oak Leaf system in Milwaukee." " While I have not personally ridden this trail, all info which I have found indicates that it is a dead straight (east-west), dead flat, suburban ""connector/commuter link"". It will serve nicely (once a few other 'links' are developed) to provide biking from downtown Milwaukee lakefront all the way to Madison. Otherwise, in-and-of itself, it has relatively little 'merit'."